London is being bombed. A girl called Lyla is being evacuated from her home to her Great Aunt Ada’s house in the West Country. She is expecting to be lonely but she has a lot to learn about friendship. She has never been to school before so that makes things a bit awkward! I have really enjoyed reading this book. It helps you understand about the war and makes you realise what the war was actually like and how much work people had to do to help the soldiers and pilots. I think this book helped me understand more about the war and what it felt like. My favourite part of this book was when Lyla meets a girl called Catherine (Cat for short) who makes up rhymes out of people’s names like ‘Faye Peak what a Sneak!’ (Faye Peak is a nasty prefect who tells on anything). I thought the history in this book was very realistic. This book made me want to read more of his books and ﬁnd out more information. I really enjoyed this book as there were always mysteries and parts which make you question - that is not right. My favorite character was Cat as she was always sticking up for Lyla as Lyla had never been to school like the other girls had. My favourite place was the bedroom Lyla was in because when she was evacuated to her Aunts house it had been her bedroom before it became a school, even though in the school it was still her room with other girls. I thought the history in the book was realistic as it felt like I was in that period of time and after reading the book it has made me want to find out more about world war two. I would like to read more books by this author because the books which this author writes are really good books and I have already read a few. I would recommend the book for 8-12 year olds. I really enjoyed this book and I particularly liked Lyla and the house because it had a sort of mystical aura about it and I like mysteries so it was a good book for me! I think the history in the book was true and it did make me want to find out more about the history of the time. Also I love learning about the wars (1st and 2nd) so again this was a brilliant book for me! I have already bought one of her other books and every night I don't want to put the book down I absolutely love this author! I love this book and I wish I could keep on reading it over and over again! The only thing that confused me was the part about Mop I didn’t quite get that bit but in the middle it explained, so even though I didn't get it at first I did get it in the end apart from that it was one of the best books I have ever read and I will recommend it to everyone!! In my opinion the book which was written by Sam Angus was amazing. This is because of the engrossing language he had used and the captivating plot which was unveiled bit by bit in every chapter. The setting of the book is in a mansion called Furlongs. This was a massive place in which there lived a butler, Great Aunt Ada and her horse- Violet. The characters in this book are Lyla, Mop (her mother), Father, Solomon (the butler), Great Aunt Ada and the pupils of the Garden Hill School for Girls. The main plot of the story is when Lyla is dropped off at her great Aunt’s house because there is a war going on (WW2) and her father is a soldier who has to go and fight in the army. Then Lyla makes a plan of escape because she wants o back to her mother in London. Soon after she realises her father is in prison and the students (instead of lessons) are told to pack monopoly sets. Years past and when she turns 16 she sets off to London to find her mother and finds mysterious letters in her mum and dads apartment. After looking around more she goes back to Furlongs and when she goes back to her room she finds some one she never thought she would see again. I have learnt that people used to keep maps and information in the monopoly sets for prisoners. Also there was a plane called the Supermarine Mk II Spitfire during the war. I would recommend this book because of the plot and how they make it quite emotive as well as being a fantastic read. Also I would recommend this to children of 9 and older. I would rate this book a 5/5. This story is about young Lyla who is taken to live with Ada (her great aunt). She hates it when she arrives, forever trying to find ways to leave but as the story progresses she finds she may actually enjoy it. During this stay at Ada’s house Lyla learns a thing or two about her family and discovers something that she finds shocking. The characters in this book are quite unique and original, they’re all different but somewhat similar in a way. My favourite character in the book is Lyla’s great aunt, Ada. I think this character is quite extraordinary and when I am her age I hope I could be as kind as her. This book was about schoolgirls being evacuated (which did happen in the war) but this book is very different to others following children being evacuated. It’s something you can just spend hours reading and you can learn something from it: nothing is as it seems. I really enjoyed this book and if I had the chance I would definitely read it again. This book offers so much and I would recommend it to anyone looking for a good read. If I gave this book a rating out of 5 I would give it a 5 because I really liked the portrayal of the characters and plot. It is 1939 when Lyla Spence is evacuated from her house in London to her great-aunt’s enormous house in the West Country. Soon the house accommodates a school for girls and there is a horse in one of the bedrooms! In my opinion, the characters felt very real and their emotions were expressed very well. My favourite character was Great Aunt Ada with her bright and bubbly personality. She loved to invent things, for example she invented pink dandelions which were like mini bombs, intended to distract German aeroplanes. Sometimes this book made me laugh and sometimes it made me cry. It was very emotional. After reading the blurb I initially thought that this book was not for me, but as I read it I began to thoroughly enjoy it and recommend it to anyone who loves drama. It definitely deserves five stars! I really enjoyed this book. It had a mix of humour and sadness. I love the mix of emotion and it moved me. My favourite character is Father (Lovell Spence) because he stays quite loyal to Lyla and sends letters as much as he can even though he is going through great difficulties in the war. My favourite event was Lyla’s birthday because that's when Cat and Solomon really showed their affection for her. And I also love the part when her father comes back to see her, he has remained loyal. Her bedroom with the yellow silk and unicorns is beautifully described so I can imagine being there in that room. I think the history was sort of realistic because most of the book was set in great aunt Ada's house so even though her father sent her letters and she occasionally went out into the rest of the world, there wasn't much connection with the war going on. Also the little bits of the grounds ( gardens and railway station) and the letters gave you an insight. I wanted the humour and the plot of the story rather than getting into the bits of the book that required deeper and sadder thought. As I've studied World War 2 I was already familiar with the historical context. Yes the book definitely did make me want to read more by this author. I was really excited by getting the opportunity to read another of her books and I have already got hold of a copy of her next book House on Humming Bird Island. I think her book was very well written and the description really worked and that she deserves to win. It is 1939, London is being bombed and children are being evacuated to the countryside. Lyla, age 11, is sent to the countryside . She has never been to school or had any friends before. She is very angry with her father when he sends her out of London to stay with her AuntAda in a country house called Furlongs. At first she plots to escape back to London but then she starts to discover how different life can be. She is given a ferret who becomes her companion. There’s and a full school oif girls comes to stay too so life is exciting and busy. She starts to make friends for the first time and realises that they come in all shapes and sizes. A book of adventures. Funny and heart-warming moments which make you want to read on. I would recommend this book to anyone over 8 years of age who love likes to go on a journey with with the characters and explore how evacuation affected children in the war. The book School for Skylacks is very interesting and I would definitely recommend this to others even if they think that this is not their type of book. The downside of this book is that it has in my opinion it has quite tricky vocabulary which so it would be more suited to 9 year olds and above. It is also a long novel and has no illustrations which some children like. This book didn’t take me that long to read. I read it in a week. I’m normally a slow reader but I couldn’t put this book down. The front and back covers are also very detailed and attractive. I would recommend it if you read this . It is amazing. I wouldn’t normally have read this because it’s not the type of book I usually go for but I took a chance and I wasn’t disappointed. Overall I really like the book but I want to know more about Mop. My favourite character is Solomon, I like how he makes everything sound formal. I think it’s rather funny how all letters get turned into aeroplanes. I can’t really imagine a house/ manor turning into a school but hey anything can happen. I think the book really suits the time period because of the war. How the book was worded made me feel like I really was Lyla and I had to live with my Aunt who is Coocoo/ mad. I think I would give School for Skylarks 7/10. I really liked this book and I hope that this author will write a sequel, but please do not leave another cliff hanger! My favourite character is Lyla because she is kind. I think the time period is accurate and I would give book 8.5 out of 10. I did quite enjoy the book because I liked the way the author wrote it and their writing technique, but I thought that up until the very end the plot of the story was quite boring and not too much happened. I did really like how they explained all Lyla's feelings and how they were very realistic feelings. The history was quite realistic, but they didn't really mention the history apart from in Lovell's letters. The book did make me want to read more books by Sam Angus purely because of the way they explained Lyla's feelings. It made me feel as though I was Lyla and I really didn't like it when Faye and Imelda were being mean to her because I just felt as though it was real. Words can be used to make people feel powerful emotions and Sam Angus used this in a really good way to make you feel lots of emotions, even though you know that it is all made up. As I said before, I didn't really like the plot of the story from the start because not much actually happened until the very last chapters, and it seemed to repeat almost the same thing every chapter. I think that they also should have included more information about the World War, especially when Lovell came back and met Lyla. I like this book because it uses descriptive language and describes the characters and settings very well. Also, I like how the parrot (Bucket) gets up to mischief all of the time. In addition, I like how Lyla writes letters to Mop about what is going on. There is one particular letter I like which Lyla wrote to Mop it was where she asked Mop to send her some soldiers to get her back to London but instead, Great Aunt Ada had some visitors and it was the soldiers Lyla wanted but it was only Pinnacle and her schoolgirls. So Lyla had to go to school but school was held in Great Aunt Adaâ€™s house. Also, Lyla still wanted to go back to London and Great Aunt Ada said no again so Lyla hid the horse (Violet) in the Maharajah'ss room and she gets found out. Reading this book makes me want to read more Sam Angus books and I recommend that this book is suitable for anyone of all ages to read. I think your idea of a book review is a great idea because some children in my class don't really like reading, so my teacher has to get a group of children, who doesn't read that often. Even I'm in it, even though I read at home every night and I fill my Reading Record with a good review. Oh yeah one more thing. I wrote a review for the book that you sent. Would you like to read it? This book is about a girl called Lyla, who was forced to go live with her auntie Ada because of the bombing in London. Unfortunately, Lyla didn't want to go because she wanted to stay in London with her father. However, her father didn't listen to her and dragged her into the car, and drove her to auntie Ada's house. Lyla saw a big castle and her father told her that it was aunt Ada's house. I was surprised and shocked when I found out that aunt Ada died in the middle of the book. It was a clever but sad twist within the book. I hope you will like this review. I enjoyed this book because in it all the phrases, words, sentences. Etc. made sense. My favourite character in this book was Lyla (Spence) because she is ˜funny and sweet and brave and unusual" as this reminds me of lots of my favourite characters for example Hiccup Horrendous Haddock the Third (How to Train Your Dragon). In School for Skylarks it refers correctly to events in World War Two, for example: evacuation which happened near the start of WW2 also rationing which was used because of food shortages and finally gas masks which were used in case of a gas attack which never really happened. This book really made me to want to read more books by this author because it really caught me and I really don'twant to give this back. The plot of this story is that Lyla (an evacuee) is'stolen from her bed' by her father, and taken to her great aunt's house (Great Aunt Ada) in Furlongs. At first she thinks it's horrible there but then she accidently invites a whole host of girls from the Garden Hill School for Girls into Furlongs and she realizes that friends come in all shapes and sizes. 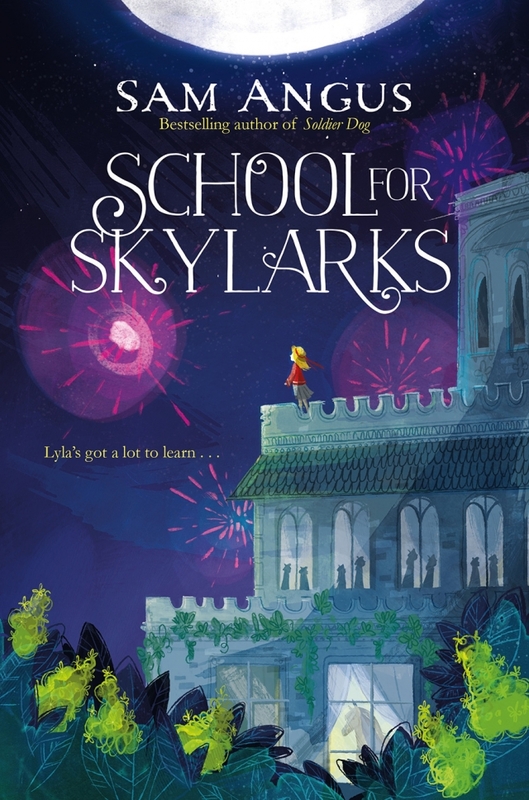 I did enjoy most of this book; at the beginning of School for Skylarks there wasn't much going on which bored me a bit, but once you get into the book it is a great story. I really enjoyed the chapter called â€œThe Red Library â€œas it has some amazing language used in the chapter. I felt that the history in the book was realistic as it showed what would happen to young girls and boys during the war (1938 - 1945 ). Based on the last Quarter of the book I would want to find out more about world war 2 as it was very interesting . Based on this book I don't think I would want to read any more books from this author as I just prefer there to be a quicker start to the story.